Chicago Bracelet -The ultimate in glamour! 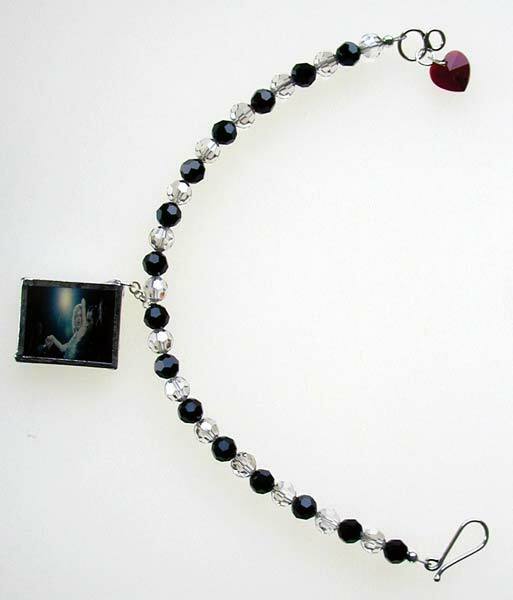 This 7" bracelet, complete with sterling silver hook clasp is made up of multi faceted 6mm swarovski beads in jet(black) and crystal shadow(more sparkly than crystal). To add even more razzle dazzle there is a small siam(red) heart charm by swarovski. Also featured is a picture of the gorgeous murderess Roxie Hart.When held to the light you can see Roxie in a fantastic silver costume.It would be a crime not to treat yourself to this stunning piece.